If you are tired of your current laptop becoming obsolete after a few years, then it is time you joined the Laptop4Life program. 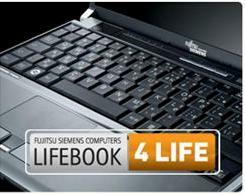 This program, created by Fujitsu, allows the user to get a new laptop free every three years. 1)	Save the receipt, which most people do out of caution anyway. Maybe a Laptop4Life member should just keep it in their wallet or purse. 2)	A user will also need to keep the laptop in good condition, presumably so it can be recycled. 3)	Purchase a 3 year extended warranty, but I don’t have a price for this. Beyond that, a user can have his or her a new laptop that is the same value as the originally one he or she purchased, with a ten percent adjustment for inflation. This program comes in handy for getting new software or other hardware, but they need to be upgradeable Fujitsu parts. So now you can set the purchase of your new laptop in sync with the new version of Windows! I have to admit Fujitsu is pretty generous to be giving out such an offer. I have heard that a user can keep this program up until the day he or she dies, but cannot pass it on to their progeny.